Paul George scored 23 points to lead the way for Indiana on Monday night in Oakland. OAKLAND, Calif. — When Paul George played at Golden State last season, he missed all seven shots he took and finished scoreless in Indiana’s loss. Instead of sulking, he went straight to the gym after the Pacers arrived back home in the wee hours of the morning. "I felt good coming off screens, dribbling the ball and hitting some shots," said George, who made 9 of 20 from the floor. "It’s just tough running around with those guys and still having legs to make shots at the end. That’s really what the toughness was." "We’re right there as a team that has the potential to do some great things this year if we can figure that last, little bit of consistency out," Curry said. "We’ve shown in spots we have the talent to do it, we just have to find that last little piece of assertiveness against the best teams in the league." After going down by 20 in the third quarter, Harrison Barnes hit a 3-pointer to slice Indiana’s lead to 79-77 early in the fourth. The Pacers pulled away by eight before the Warriors roared back within three on Lee’s free throws. "It was like the movie ‘Rocky II.’ I’m not sure which guy was going to fall first. Both teams were completely exhausted," Vogel said. The Warriors’ final push ended almost as quickly as it started. 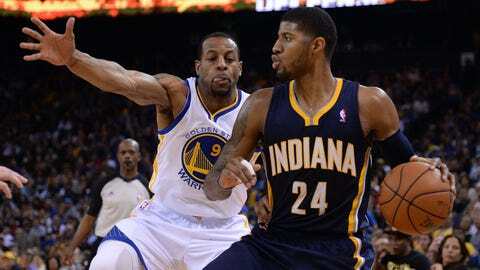 Andre Iguodala made a fadeaway to trim Indiana’s lead to 98-94 with less than a minute left. After Iguodala stole the ball from Hill, Curry missed a contested 3-pointer short, and the Pacers put the game away on free throws. "We’re close, but we still have work to do," said Warriors center Andrew Bogut, who had 10 points and 13 rebounds. The Warriors entered the night having played an NBA-high 25 road games compared to 17 at home. The game began a string of five straight and nine of 11 at Oracle Arena, though Golden State’s home court provided little comfort against the NBA’s best. But Curry and Co. quickly had fans on their feet and to a fever pitch after a timeout. Curry hit a jumper, then tossed an alley-oop to Bogut before Thompson’s 3-pointer started a run that brought the Warriors within eight heading to the frantic fourth quarter. NOTES: Warriors coach Mark Jackson said it was an honor to play on the holiday honoring the Rev. Martin Luther King Jr. "I’m not sitting here if he didn’t have a dream and he didn’t fight for that dream the right way," Jackson said. … The Warriors haven’t won a series against the Pacers since the 2000-01 season. … Indiana hosts Golden State on March 4 in the teams’ only other meeting this season.